The Nebraska Investment Council manages the investments for several endowments and various trusts. The investment strategy for these portfolios varies based on the objectives of the portfolio. The Health Care Endowment Fund is comprised of two distinct state trust funds. These two are the Nebraska Tobacco Settlement Trust Fund and the Nebraska Medicaid Intergovernmental Trust Fund (IGT) . Although their external contributions are different, the investments are the same and the spending policy is similar. The Nebraska Investment Council’s responsibility is managing the investments. 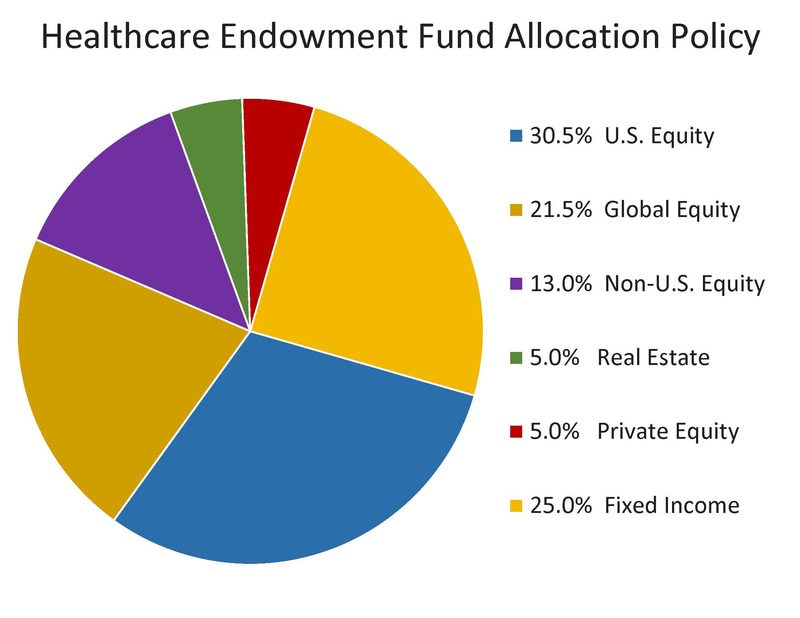 The Health Care Endowment Fund, the Council maintains an asset allocation consisting of 30.5% U.S. equity, 21.5% global equity, 13% non-U.S. equity, 5% real estate, 5% private equity, and 25% fixed income. Permanent School Fund - The endowment receives proceeds from the sales of school land held in trust for public education, payments for easements and right-of-way over the lands, and royalties and severance taxes paid on oil, gas, and minerals produced from these lands. The net income earned on this fund is distributed annually to the K-12 public schools. The Nebraska Early Childhood Education Endowment Fund - The endowment provides funding for grants to schools and community partners to provide programs serving at-risk children birth to age three. The Nebraska Veterans’ Aid Fund - The endowment provides emergency financial assistance to eligible veterans and dependents. The Cultural Preservation Endowment Fund - The endowment supports the activities of the Nebraska Arts Council and the Nebraska Humanities Council. Distributions from this fund are conditioned on matching contributions from other sources. The Agricultural Endowment Fund - The endowment receives proceeds from sales of land granted by the federal government. Investment income is distributed to the Institute of Agriculture and Natural Resources. The Permanent Endowment Fund - The endowment receives proceeds from the sales of land granted by the federal government. Investment income is distributed to the University of Nebraska. This fund is also called the Permanent University Endowment Fund. The Normal School Endowment - The endowment receives proceeds from sales of land granted by the federal government. Investment income is distributed for the benefit of the state colleges. This fund is also called the State College Endowment Fund. The Nebraska Environmental Endowment Fund - The endowment is funded by the state lottery program and is part of the Nebraska Environmental Trust. The Trust provides grants for the purposes of environmental conservation in Nebraska. The Bessey Memorial Fund - The endowment provides aid to widows of University of Nebraska professors. 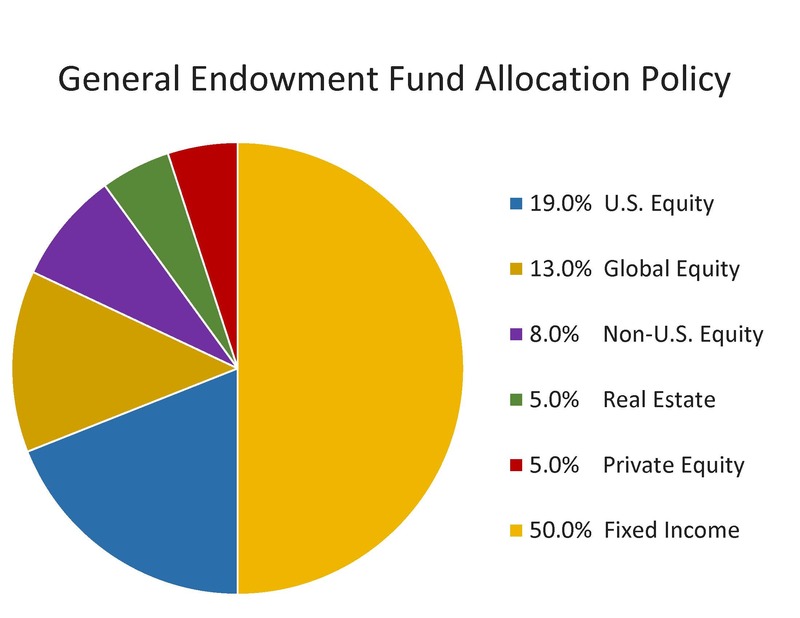 For all of these Funds the Council has selected an asset allocation consisting of U.S. equity, global equity, non-U.S. equity, real estate, private equity, and fixed income. A portion of the assets designated for real estate and private equity investment are currently invested in the U.S. equity portfolio.